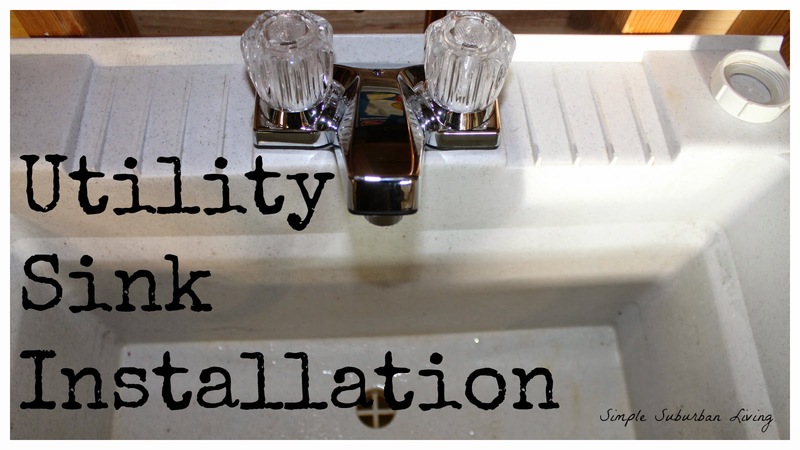 Check out this video to see how to install a simple utility sink in your home. Have some sort of utility tub or sink setup in your home is a must for any home owner. No more washing off paint brushes in the kitchen sink, no more greasy hand washing in the same area you wash you dishes. If nothing else, your wife will thank you! Since we have lived here in this home for a few years I have been wanting to get this installed and it kept getting put on the back burner. Until a few weeks ago I passed by a perfectly good utility sink at the end of someone's driveway as a giveaway. Call it divine intervention or just a lucky break but it inspired me to get this project put to the top of my list. The fist step once you have a sink and faucet picked out is to locate a good spot in the basement for the sink. The best place will be in range of a floor drain and some overhead copper water supply lines. You want to make sure that your water supply is tapping into a 3/4" supply and not a 1/2" supply. 1/2" supplies are not meant to be split another times as they are already split from the main water supply line once. Once you have a good location get your supplies together and get ready for a messy, somewhat stressful, and eventful afternoon in your basement working with one of my favorite tools.....the torch:) Make sure to leave yourself enough time to account for anything that might go wrong since this project will require that the entire water supply to the home is turned off for a bit. Start by turning off the water supply to your home and then hooking a hose up to the drain on your water heater. Next open the drain and a few faucets on each level of your home. This will allow air breath into the pipes and the water to drain completely back to the water heater which should be the lowest point in the system. Once the pipes are drained out, close the water heater drain and get ready for cutting and soldering. Once you have your Tee in place on a 3/4" supply pipe go ahead and start measuring, cutting, and soldering your supply pipes over to your utility sink location. Remember to follow local codes and if you are unsure of where you can drill holes or how to run the lines consult with a professional plumber. Once your water supply is run, solder on some supply valves and turn them to the off position. Now you are ready to get your water turned back on and start to fill up those pipes and check for leaks. This is that somewhat stressful time I talked about:) Did it leak, how do your joints look? I can say from experience that no matter how diligent you are sometimes in hard to reach places leaks can occur. Make sure to let the system sit for a bit and then keep checking for any drips. If you find any drips you will need to drain everything back out and re-solder the leaky fitting. Now that you are all hooked up and leak free it is just a matter of hooking up your flex water lines from the valves to the faucet and you are in business. All you need now is a drain....... more on that later.